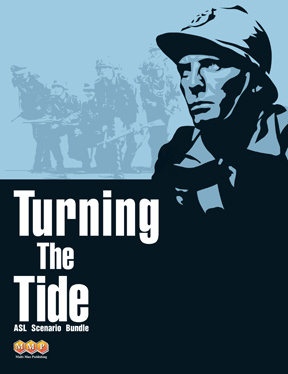 Turning the Tide includes 20 scenarios that are updates to the Advanced Squad Leader system of Squad Leader scenarios from Cross of Iron, Crescendo of Doom, GI: Anvil of Victory, the 100 Series, the 200 Series, and the “Rogue 200” scenarios. These updated scenarios have not previously seen print in ASL form, although two have been available for download from the MMP website. They range from the beginning of World War II in Poland through the Russian offensive in the Ukraine across the Dnieper River, following the Battle of Kursk in 1943. Turning the Tide’s scenarios feature the forces of Poland, Belgium, The Netherlands, Norway, France, Britain, Greece, Russia (and Russian partisans), and the United States all battling Germany. Scenarios take place in both night and day, winter and summer, and involve cavalry, motorcycles, air support, parachutes, and gliders as well as armor clashes and infantry battles. Most take place in the countryside, but there are actions in cities and towns as well as forests and mountains, and some involve seizing bridges over rivers and canals. The majority of the scenarios can be played with just boards 1-5, and only two require a board that was not part of the original SL-GI system. None of these scenarios use overlays. Whether you cut your teeth on Cross of Iron or picked up Beyond Valor for the first time yesterday; whether you prefer Matildas vs. PzKpfw IIs or T 34s vs. PzKpfw IVs; Turning the Tide’s array of interesting scenarios has something for you. Twenty-five years in the making, and a true labor of love from the original ASL grognard Jim Stahler, Turning the Tide is the penultimate step in converting SL-GI scenarios to ASL. We are already working with Jim on a follow-on scenario bundle to cover September 1943 through May 1945 to complete the ASL updating process.